In 2011, Nancy Shaffer�s life suddenly changed when she was diagnosed with a fatal brain tumor. Here is her heartrending and heartwarming account of her final year as she came to terms with impending death. 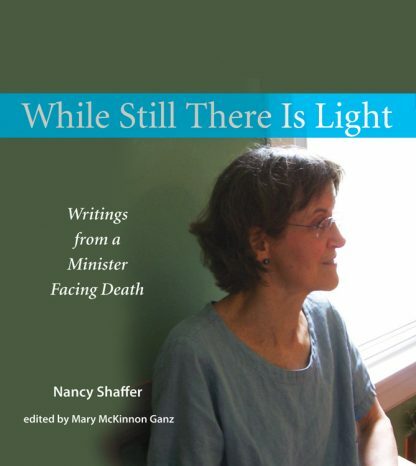 Part journal, part reflection, and fully honest, Shaffer�s account of her journey through denial to peaceful acceptance will lend inspiration and courage to those in need, and insight to those who give pastoral care. Nancy Shaffer (1950-2012) was a Unitarian Universalist minister, a poet, and the author of Instructions in Joy: Meditations (Skinner House Books, 2002). She served congregations in Carmel, California; Glen Allen, Virginia; Evanston, Illinois; and Ann Arbor, Michigan. Mary McKinnon Ganz was a dear friend of Nancy Shaffer. She is the co-minister of First Parish of Brewster, Massachusetts, and previously served the UU Church of Arlington, Virginia.